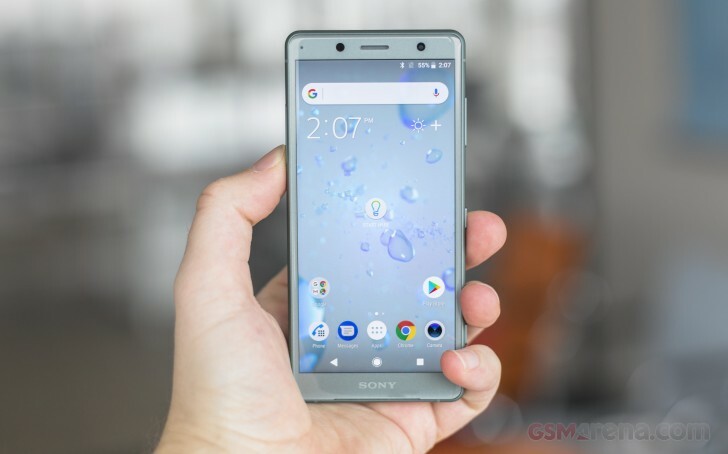 The most obvious upgrade on the Sony Xperia XZ2 Compact is the screen. Sony has opted for the new tall aspect ratio and increased the diagonal to 5". But the larger size is not the only upgrade. The screen resolution is now 1080p - for the first time ever on a Compact phone. That's a flagship-grade 483ppi density. The LCD screen features all of Sony's proprietary display tech - Triluminos display and the X-Reality Engine. There is also HDR support - the panel supports 10-bit colors and is certified for the BT.2020 standard. The new screen has deeper blacks but lower maximum brightness if compared to the XZ1 Compact. Then again, the XZ2 Compact screen is very bright at 576 nits and thanks to the improved blacks it achieved an excellent contrast ratio of 1315:1. Sunlight legibility turned out great for an LCD and you won't find yourself struggling with outdoor light when using the Xperia XZ2 Compact. The LCD panel on the XZ2 Compact is well-calibrated against the DCI-P3 color space, which we typically test against. The default Standard color mode gives an average deltaE of 4.4 and a maximum of 8.5. No matter how much we tried, whites and grays always retained a certain level of blue tint. Finally, let's talk about the HDR video support. As we established, there is support for 10-bit colors, and there is a certification for the BT.2020 standard. Determining how that correlates to other industry standards, like HDR10 video is a bit difficult and needlessly technical. In practical terms, all that really matters is whether content vendors, like Netflix, enable their HDR content for the XZ2 Compact. For now, the best way for early adopters to take advantage of the HDR panel is by watching the compatible 4K HDR clips captured by the phone itself. Sony also offers an automatic conversion system, as part of its "Advanced X-Reality for mobile" engine. It takes SDR video content and seamlessly tries to upconvert its colors to HDR levels during playback. If you've seen an HDR TV attempt to do the same, you probably already know that it looks great only on cherry-picked demo videos. Real-world usefulness depends strongly on your content. You can probably expect to salvage some detail in shadows and fix some light smear in low-light shots, but it can't do miracles. If the data isn't there, it isn't there. The Xperia XZ2 Compact comes with a larger battery capacity at 2,870 mAh than the Xperia XZ1 Compact. It goes from 0 to 32% in half an hour when using its 1.5A charger. The units bundled with a QC3.0-compatible charger will have up to 41% of their depleted battery fill in 30 mins. Sony has proven quite proficient in optimizing the software for long-lasting battery autonomy, so we had high hopes for the XZ2 Compact. And indeed, the phone posted an excellent 88 h endurance given the provided battery capacity and the hardware at hand. The Xperia XZ2 Compact did great on all battery routines. Combining those great scores with a frugal standby consumption, it achieved a great endurance and Sony's claim on battery efficiency lives on. Our endurance rating denotes how long a single battery charge will last you if you use the Sony Xperia XZ2 Compact for an hour each of telephony, web browsing, and video playback daily. We've established this usage pattern so our battery results are comparable across devices in the most common day-to-day tasks. The battery testing procedure is described in detail in case you're interested in the nitty-gritties. You can also check out our complete battery test table, where you can see how all of the smartphones we've tested will compare under your own typical use. Despite the increased screen size, Sony has still managed to fit a good stereo setup inside the new XZ2 Compact body design, and we appreciate that. And it is one of the better ones we have seen. Our tests can mostly confirm Sony's claim - the stereo speakers are about 20% louder than the XZ1 Compact and scored a Very Good loudness in our test. The speakers sound great with rich sound and there is no distortion at maximum volume. It's a significant improvement over the previous generation. Unlike the Xperia XZ2, the Compact model doesn't come with the new Dynamic Vibration System, which vibrates in tune with any sound the phone gives off. The Xperia XZ2 Compact is a perfect match for its larger Xperia XZ2 sibling when it comes to audio output. When hooked to an active external amplifier the XZ2 Compact had above-average loudness and perfect clarity. Plugging in a pair of headphones dropped the loudness to only average, but the accuracy of the output didn’t see much damage. The hike in stereo crosstalk was well contained and while some intermodulation distortion did creep in, it’s nothing you will notice without dedicated testing equipment.